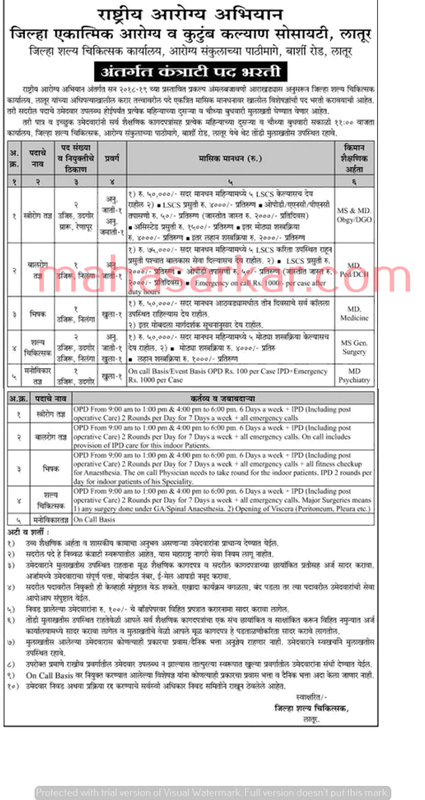 NHM Latur (National Health Mission), Latur Published Job Notification for 07 Gynecologist – Physician & More Posts. Candidates who wish to apply must look at NHM Latur Gynecologist – Physician & More Recruitment 2018. Eligible candidates can join Interview on Every Second and Fourth Wednesday of the month. Education Qualification: MD/MS and More. For Post wise Education Details follow the detailed advertisement. Interested & Eligible candidates may attend for walk in interview along with all the documents addressed at जिल्हा शल्य चिकित्सक कार्यालय, आरोग्य संकुलच्या मागे, बार्शी रोड, लातूर. Starting Date, Last Date to Apply Offline at National Health Mission which candidates should be remembers as follows. Interview on: Every Second and Fourth Wednesday of the month. NHM Latur (National Health Mission), Latur Published Job Notification for 80 Accountant- Specialist Doctors & Many More Posts. Candidates who wish to apply must look at NHM Latur Recruitment 2017. Eligible candidates can apply online before 11-12-2017. Education Qualification: B.Com/GNM/ANM/B.Sc/MBA/PG/MSCIT/MD/MS/D.Pharm/B.Pharm/MBBS/10th/12th and More. For Post wise Education Details follow the detailed advertisement. Age Limit: Candidate minimum age limit must be 18 years. Interested & Eligible candidates can apply online through the website zplatur.gov.in earlier than the due date. Starting Date, Last Date to Apply Online at National Health Mission which candidates should be remember as follows. Start Date to Apply Online: 02-12-2017. Last Date to Apply Online: 11-12-2017.